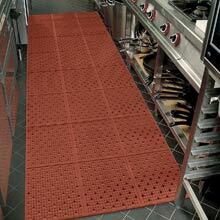 Kitchen Floor Mats are a key essential to productivity in your restaurant or home. Whether you’re looking to reduce stress with anti-fatigue mats or prevent slips and falls we have you covered. Easy to clean and maintain these products won’t crack or curl. Get cookin’ today with one of our many Kitchen Floor Mats. Questions? Give us call at 224-654-6500 we are happy to help.